Designer and kit maker was Adrian Page. Very nice kit. Lazer cut and well thought out design. Light weight for its size. 75" wingspan. Can be powered by glow, gas or electric. Mine started out with a Zenoaha 26cc gas. After a couple years flying opted for a DL50cc gas with electronic ignition. (weighed about the same as the Zenoaha. Way to much power but lots of fun. Kit was out of production for several years. But Adrian is tring to make a comeback in the kit business. If interested go to: www.adrianpage.com. This will take you to his kickstarter site. You won't find a better design or better customer service. He has several other designs as well. Thanks for sharing Paul, that's an awesome looking bird! Is it a lot harder to fly than an conventional low wing airplane? I've always said there isn't a relaxing moment the whole time it's in the air. Take off is fairly easy. Mine is heavier than the designer intended and the engine makes this plane a little overpowered. So the throttle has to be advanced slowly to prevent the prop from pulling it over. Flying is fairly standard for a low wing aircraft. But you must use the rudder in the turns. Landing is the hardest. I have custom made spring struts on it to help. So I have to land it on the mains with the engine at a fast idle. Once on the ground pull the throttle back slowly and hope it settles on the rear wheel and not on its back. Easy? No, but a lot of fun! I'd be too scared worried about the landing to enjoy the flight. Especially a good looking plane like at that! Have any Youtube videos of her? I wish I did. Been flying it for several years and no videos. I know at a couple of fun flies I've been to that someone took some videos but I haven't got my hands on them. Last year a friend at our club was going to video it. But I had a rudder problem on take off and crashed 5 seconds later. Soooo. This year my first order of business will be to get a flite video and post it. Some time in the next month. So stay tuned. Been rebuilt several times. Its just wood, paint and time. I just hope this will be the year of no rebuilds. I'm new to fling and i home to be able to fly this caliber of plane. My wife really likes this plane and i have been building planes for a few months and hope to be able to build one in the future. I would get comfortable flying a heavy wing loaded aircraft before building a Gee Bee. Try a warbird like a P51 or P47 first. 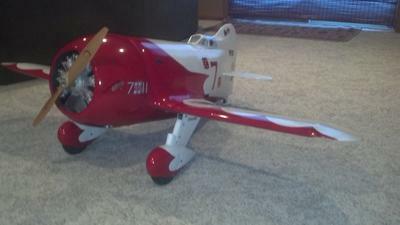 The best Gee Bee kit I can recommend is from Adrian Page. He has just recently started aquiring equipemnt to start to produce some kits. He can be found at adrianpage.com. 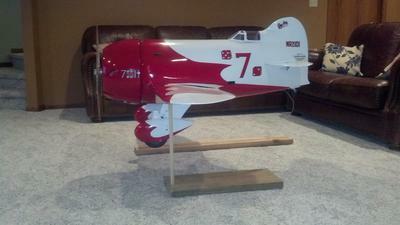 The Gee Bee gets alot of attention at the field but also gets alot of attention in the repair shop. Good luck. Check out Sierra Web site. They have made the 1/4 scale gear for the Hostetter plans kit. Or if your handy with a welder or torch you can make some like I did for mine. I wouldn't recommend the wire set. The are not stable enough to keep the plane going on a straight line. I probably have a spare set of wire gear that came with the Adrian Page 1/4 kit. If you want them let me know.